In need of some inspiration? Are you feeling you’re losing your mojo? This is the ultimate guide for English teachers in the 21st century because it not only offers advice about the content, skills and strategies necessary to become an effective English teacher but also provides invaluable help in dealing with the stresses and strains of the job. The well-being of students and teachers are seen as integral to outstanding teaching and learning. 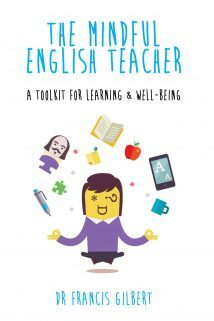 The Mindful English Teacher is jam-packed with creative ways to be happy and productive on the job: it is full of useful meditations, creative visualisations and activities which not only make being an English teacher fun but also with its moments of relaxation. It is undergirded with a firm grounding in theory and evidence-based practice, which is explored in the form of lively scripts, real-life conundrums & audits. The scripts can be read by groups of teachers, making the book ideal to use for school-based CPD or Initial Teacher Education. This unique guide aims to inject a genuine sense of joy into one of the most challenging jobs in teaching, using techniques that have been proven to work in a wide range of educational settings. Teacher Toolkit: the Profession’s Great Freedom Fighter!